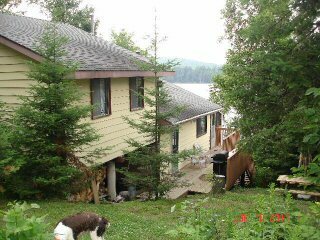 Cozy 3 bedroom cottage overlooks Baptiste Lake. Open concept kitchen, dining, livingroom offers lovely views. Walkout to the large screened porch. Good stairs down from deck, and the path leads through the trees to the waterfront. You can step off the dock to good swimming. Enjoy a wonderful family holiday! 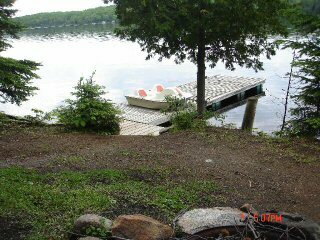 For more information, please visit www.CottageRentals247.com. Large screened porch runs the width of the cottage. Sleeping: 1 Queen bed, 1 Double and 1 Bunk with Double on bottom, and Single on top. Also a pullout couch in the livingroom for extra sleeping. Oars for the aluminum boat are included. 2 Adults lifejackets. For boat/motor rentals, contact Baptiste Lake Marina 1-613-332-1233.